Cornwall is a historic/beautiful/isolated/deprived county at the tip of southwest England. Penzance is the westernmost town, a few miles from as far as you can go, and the end of the line anyone travelling by train. Newcastle's actually further from London, but getting to Penzance takes twice as long thanks to the dawdliness of the Cornish railway. I took advantage of a pair of £12 rail tickets and booked three nights away, using the town as a base to explore... a Kernow safari I will now proceed to describe at length. PENZANCE is an old fishing town with a population of about 22,000 (which for those of us with a SW Herts mindset makes it approximately a Rickmansworth). 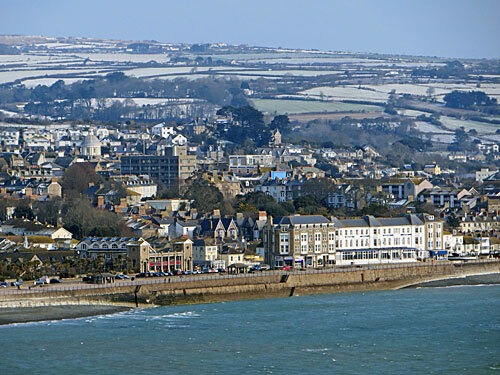 Penzance faces the English Channel on the rim of Mounts Bay, a sweeping 40-mile curve of rock and sand, its understated harbour no longer a driving force, nor indeed especially attractive. The main drag is Market Jew Street, from the Cornish 'Marghas Yow', meaning Thursday Market. These days the Market Hall is closed, and occupied instead by Lloyds Bank, but its dome still provides the dominant feature at the head of a downhill run of high street shops. The big statue in front of the former Guildhall is of Sir Humphrey Davy, who was born in a house alongside in 1778 before moving up country and transforming chemistry. The northern pavement is raised above the roadway, and accessed via a series of tiny stone staircases, which must cause the occasional tumble. Amongst the traders are the usual Sports Direct, WH Smiths and Santander, but also several minor independents and charity shops, and a heck of a lot of shops that sell pasties. Warrens has three branches on the same road, the Mounts Bay Pasty Company displays its awards on a chalkboard, and Lavenders is the place for a more deli-artisanal bite. Leading further uphill is Causewayhead, a pedestrianised shopping street, where the Indoor Market used to be. Partway up is the Savoy, opened in 1912 and allegedly the oldest continuously running cinema in the UK (if you discount the recent temporary closure which saw screens two and three combined). I was hoping to pop in and enjoy a screening, but it turned out the only decent film on the schedule was one I'd accidentally seen in Hackney earlier in the week. An even older business is Pengelly's Shoes, established in 1899... but whose closing down sale is alas currently underway. For something a little more historic try Chapel Street, which wends down to the harbour via the parish church, and is where all the boutiquier establishments hang out. 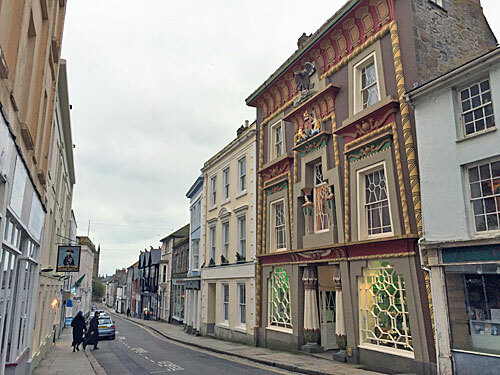 The most striking building is the Egyptian House, a triumph of eccentric post-Napoleonic style, built as a geological museum, and whose upper floors are now three holiday cottages. Smugglers used to operate from the cottages and inns further down, which may go some way to explain the presence of a man in a tricorn hat outside the Admiral Benbow on Saturday evening. Chapel Street's top prize for business name goes to a Mac repair business called Apple Crumble. And right down at the bottom is the town's gold pillar box, celebrating rower Helen Glover's 2012 Olympic success. The ferry to the Isles of Scilly leaves from the harbour, offering a potential sub-£40 day trip if your stomach can tolerate the swell. I might have been tempted except that the first scheduled ferry of the year departed on Monday, and I was already on the train home before it returned. I was also thwarted in my attempt to enjoy a slap-up fish meal at the main harbourside restaurant, which it seems doesn't open at 6.30 every evening as the sign on the door promises, so those local scallops alas went ungulped. Neither is March the right time to visit the Art Deco Jubilee Pool, an outdoor lido on the seafront. It's currently closed so that geothermal power can be piped in to heat one section, the funding provided by that pesky European Union which the majority of the local populace voted against. Instead a bracing walk along the promenade is the best that's on offer, although I don't recommend trying this in a driving blizzard - conditions which thanks to the Gulf Stream beset the town with exceptional rarity. 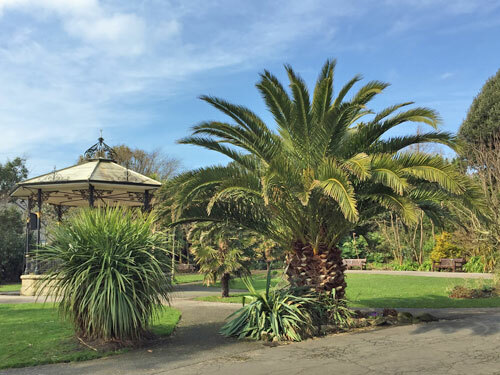 Indeed Penzance's temperate climate makes it one of the few places on the English mainland where sub-tropical plants can thrive, with Morrab Gardens a prime example in the heart of the town. Thick-trunked palm trees droop brazenly, the camelias are already past their best, and in one corner I was impressed to see primroses in bloom long before April. The other central park is less jungly, but does contains Penlee House, Penzance's museum and art gallery. I missed out on most of the art, thanks to a badly-timed rehanging, but the museum's very informative, so I now know all about the local archaeology and why the town's historic coat of arms features a decapitated head. 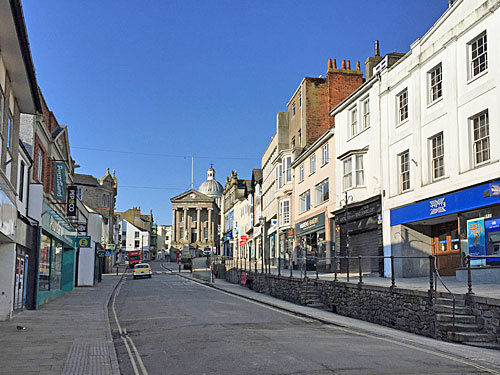 I was in Penzance long enough to be able to explore some of its lesser-trod streets, from the tightly packed terraces on the slopes above the high street to the broad thoroughfare of guest houses leading down to the shore (Sorry No Vacancies). I think I passed a drug deal on creepy Bread Street, and the well-wrapped old lady sat outside the art gallery was definitely smoking pot. A very mixed community lives here, with unemployment high, and it was noticeable on Saturday night that Wetherspoons was packed while the higherbrow restaurants sat mostly empty. No doubt you'll be wanting to hear all about the railway station. I stayed just across the road in the Longboat Inn, which I can recommend as a place to stay if you're ever in town. A pub with a restaurant and an internet cafe and a left luggage facility ticked all my boxes, the staff were chirpily polite, and the cooked breakfasts continue to register on my bathroom scales now I'm safely home. Let me also recommend Penzance as a base for exploring the surrounding area - relatively accessible, not so posh as to be expensive, and just characterful enough to make a stay a pleasure.